Before there were Ducks and Angels in Anaheim and before there were Dodgers or Lakers in Los Angeles, there was Quarter Horse racing at Los Alamitos Race Course. What started out as informal match races on the Vessels Ranch in 1947 has grown into year-round Quarter Horse racing in California. This year Los Alamitos Race Course will celebrate its 68th season of pari-mutuel racing. Instead of neighbor against neighbor match races, horses at Los Alamitos will race for purses that total a national Quarter Horse record of over $20 million. 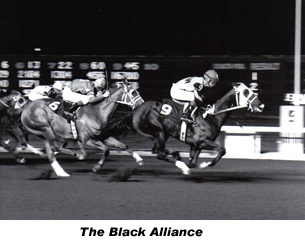 This year also marks the 18-year anniversary of year-round Quarter Horse racing at Los Alamitos. This year’s meet will get underway on December 29, 2017 and will continue through Sunday, December 16, 2018. Los Alamitos will run three nights a weeks with the exception of New Year’s Eve, Saturday, December 31, Super Bowl Sunday on February 4 and Easter Sunday, April 1. Three races worth $1 million or more will highlight the meeting. The million dollar races are the Ed Burke Million Futurity, Golden State Million Futurity, Los Alamitos Two Million Futurity and the Los Alamitos Super Derby. Other major events include the California Breeders Champions Night on Saturday, July 29 and the Champion of Champions on Saturday, December 15. Frank Vessels, Sr., the patriarch of the fabled Vessels family and the man who founded Los Alamitos Race Course, came to California from Kentucky in 1920 with exactly $19 in his pocket. After nearly three decades of struggling, Vessels started a small construction company that specialized in building drilling platforms for the oil business. After 20 years with his own construction company, Vessels had the money to chase what had become a dream for the Kentucky native - he decided to build a racetrack on a portion of his 435-acre Orange County ranch. The first pari-mutuel meeting at Los Alamitos in 1951 was an 11-day affair that was pelted by constant rain. Frank Sr. along with his wife Grace, their son Frank Jr. and his wife Millie, worked endless hours during that first meet mainly trying to repair the damage the constant rain caused to their fledgling racetrack. Undeterred by a wet first meet, Vessels sank $100,000 into new improvements and convinced the California Horse Racing Board to grant him 16 days of racing the following year. 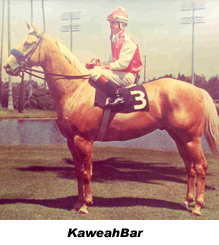 That 1952 meeting saw business double over the previous meet and Quarter Horse racing in California had found a home. 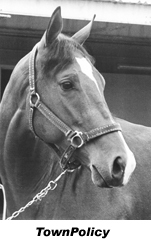 Every new sporting venture needs a superstar and in 1955 the first quarter horse superstar hit Los Alamitos when a rugged roan 2-year-old with a catchy name began burning up the straightaway. 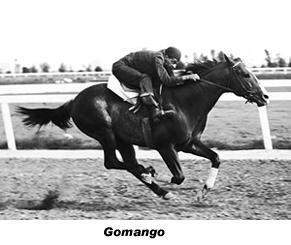 Go Man Go was just what the California Quarter Horse business needed in 1955 - he was a brilliant runner with a distinctive look and personality. His appearances at Los Alamitos drew notice from fans and sportswriters who had never before heard of Quarter Horse racing or Los Alamitos Race Course. Huge crowds would gather at Los Alamitos on the days Go Man Go would appear and these fans would actually chant the roan colt’s name as he drew away to victory after victory. Go Man Go was just the first of a host of great Quarter Horse runners to compete at Los Alamitos. Over the 60-year history of the track, Los Alamitos has been the home of countless champions including such Quarter Horse legends as Vandy’s Flash, Jet Deck, Kaweah Bar, Charger Bar, Dash For Cash, Sgt Pepper Feature, Dashs Dream, Corona Chick, First Down Dash, Refrigerator, A Ransom, Whosleavingwho, Be A Bono. Ocean Runaway, Moonist and Heza Dasha Fire. 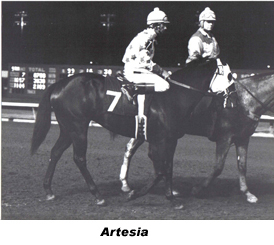 For the first 35 years in the history of Los Alamitos there was one constant - the track was owned and operated by a member of the Vessels family. However, in the mid 1980s the track would undergo some tumultuous times as ownership of Los Alamitos passed to new hands. It was not until 1990 that those rocky times ended when a man very familiar with the history of the track came forward to become a part of the history of the track. When Ed Allred first came to Los Alamitos Race Course in 1956 it is a sure thing that hardly anyone gave the then law student any attention. The only reason Allred was at the track was because he had read that the Allred Brothers were racing horses at Los Alamitos that day. While the Allred Brothers were no relation, that first trip to Los Alamitos began a Quarter Horse love affair for Allred. Now, some 50 years later, he is not only the leading breeder in the Quarter Horse sport; he is the sole owner of Los Alamitos Race Course. Under Allred's leadership, Los Alamitos Race Course has undergone drastic changes and has enjoyed tremendous growth. The major change in the face of Los Alamitos Race Course in the past 20 years has been the addition of The Vessels Club, an $8 million lavish Turf Club built by Allred and named in honor of the founding family of the track. Since its opening in December of 1995, The Vessels Club has earned the reputation as one of the finest horse racing venues in the country. In addition to plush decor and elegant surroundings, the food in The Vessels Club has earned awards from several restaurant associations including being named the top sports park restaurant in Southern California. More recent additions such as the Players Room, Rodney's Bar, Schwanie's Grill at the Gap and Paddock Terrace have added to Los Alamitos' fan enjoyment. Another Allred innovation that proved to be a major success is the Los Alamitos Two Million Futurity, a December race for 2-year-olds that in less than a decade has grown to the richest horse race for any breed annually run in the state of California. Even the name of the Los Alamitos Million has grown, as it is now known as the Los Alamitos Two Million Futurity. Since 1995, this race has annually offered a purse of more than $1 million and since 2006 it has often feature a $2 million purse. Los Alamitos Race Course is also the home of the Los Alamitos Super Derby, which annually offers the richest purse of any race for 3-year-olds in California. Los Alamitos Race Course will also be the home for the richest California-bred race of any breed when the $400,000 Governor's Cup Futurity highlights the 15 stakes scheduled for California Champions Night on July 28, 2018.